Today we’d like to introduce you to Stephanie Smith. 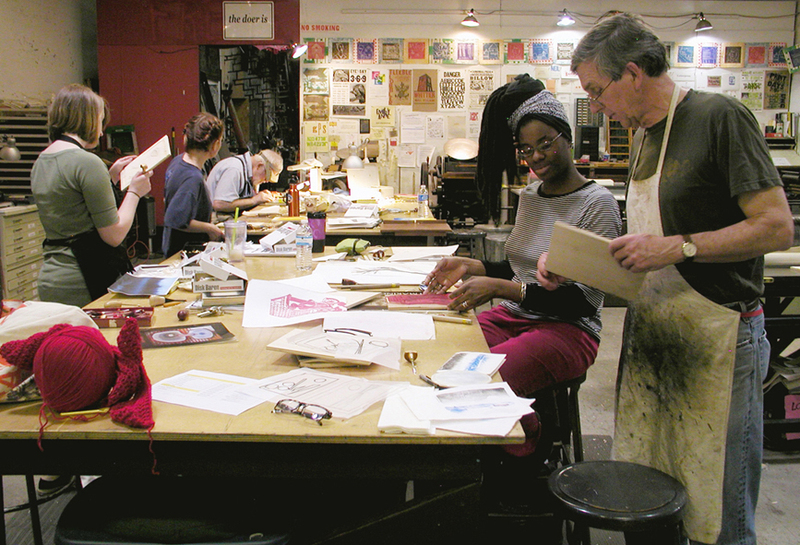 In 2005 I co-founded Atlanta Printmakers Studio (APS), a vibrant non-profit community art center that offers equipment access, critical exchange, and collaborative opportunities between artists as well as classes, workshops, printmaking demonstrations and exhibitions. 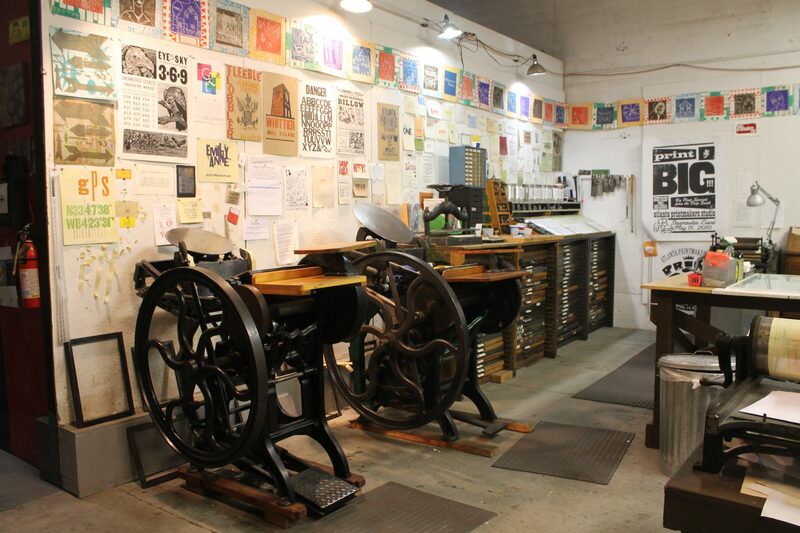 Our mission is to promote and foster the fine art of hand-pulled printmaking for experienced and emerging printmakers and anyone who wants to learn, in a supportive role through providing studio space and equipment, an Emerging Artist Residency, internships and educational program offerings and community events like our Print Big! steamroller printing day. Today I teach in the art department at the University of West Georgia and am a studio artist working in printmaking (mainly relief prints and screenprint). Back in the early 2000’s after graduate school at UGA, I was teaching at several local colleges and community art centers in Atlanta. At that time, there were a lot of printmakers and recently graduated art students who wanted to work but had no equipment of their own and no press access. 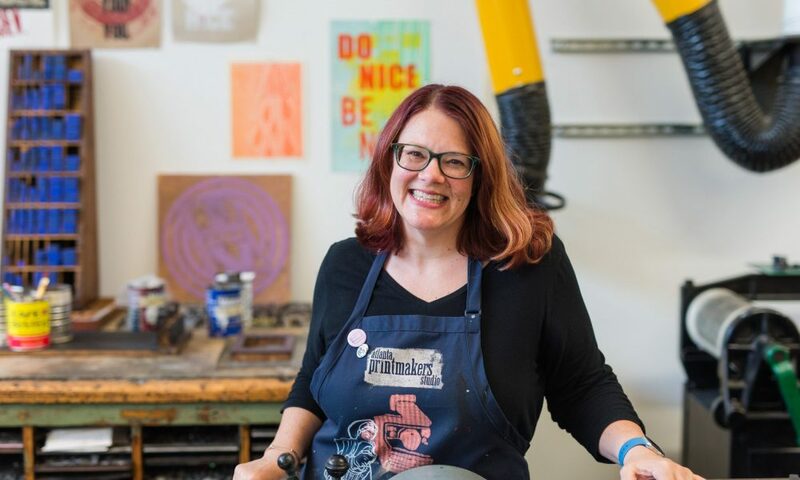 The art form of printmaking is a little like ceramics or sculpture in that it is process-based and can require specialized and heavy equipment like presses and inks and chemicals you might not want to use in your living room! There is an inherent collaborative aspect (unlike painting) that I love. You have to share equipment which leads to sharing ideas, techniques and is a really rewarding experience. Between 2003-2005 Atlanta lost three important resources which were the catalyst that galvanized Andrea Emmons, Kathy Garrou and myself to develop the Atlanta Printmakers Studio. The folding of Nexus Press, an international artist book press, the death of Wayne Kline, a lithographer and Tamarind master printer who ran Atlanta’s Rolling Stone Press, and the closing of the Atlanta College of Art, my alma mater. 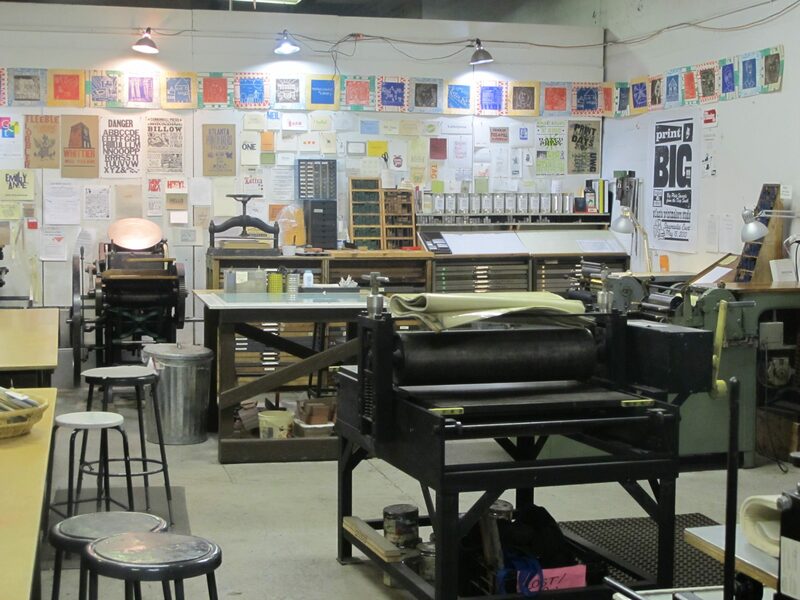 Atlanta Printmakers Studio started in order to fill a void for artists and printmakers in Atlanta & the Southeast. Luckily, there was a good amount of interest in printmaking in the area. Kathy, Andrea and I, along with local artists Terri Dilling and Judy Winograd, reached out to a broad network, including people who had taken classes at local community art centers, students and professors at local colleges and universities, graphic designers, art curators/collectors and art supporters. We organized several brainstorming meetings and determined what we wanted to create. We received our 501(c)3 status, received several small seed grants to get equipment, and found studio space in 2006 and set up shop. I served as President for the first 5 years as we developed the organization (which was the equivalent of a second full-time job!) until we were financially able to hire a director (co-founder Kathy Garrou). We have an amazing volunteer board of directors and board of advisors and member supporters and artist renters who form our welcoming and inspiring community. It’s really been trial and error and we have learned a lot as we have evolved. 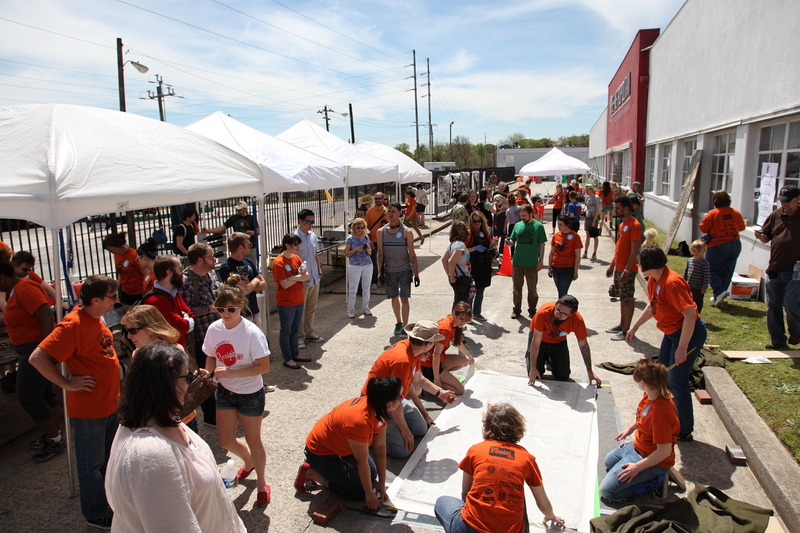 We are still a grass-roots organization with tons of committed volunteers who serve this arts community. None of us really had non-profit experience but we leveraged our training as artists and designers which includes critical thinking and major problem solving for this project. Generally, printmakers tend to be organized, think in layers and are careful planners, but able to work spontaneously and adaptively when things go wrong or in unexpected directions (as they often do in the studio!). Just moving all our presses from random basements and storage into our studio was an exercise in problem-solving! Like most small non-profit arts organizations our biggest challenges are money, staff and space. Since an important part of our mission is to provide a studio with the equipment we need an adequate space. We have loved our home in the Metropolitan Warehouse complex but it is time for us to relocate to space with better amenities, climate control, and access. Real estate in Atlanta is so prohibitive for the creative class (among others) and the high-end development and prices are pushing artists away from downtown. Staff is a pressing challenge for us right now. In addition to studio access for artist renters we host an ongoing schedule of classes, workshops and public events so we service thousands of people in the region. All of that with only one full-time staff person (who does everything from grant writing to fixing presses) and dedicated volunteers is a struggle and we are working to be able to afford to add additional staff. Fine art printmaking is a way of making original artwork using the main techniques of relief, etching, lithography and screenprint. Other techniques include letterpress, bookbinding, monoprints, cyanotypes and collagraph. 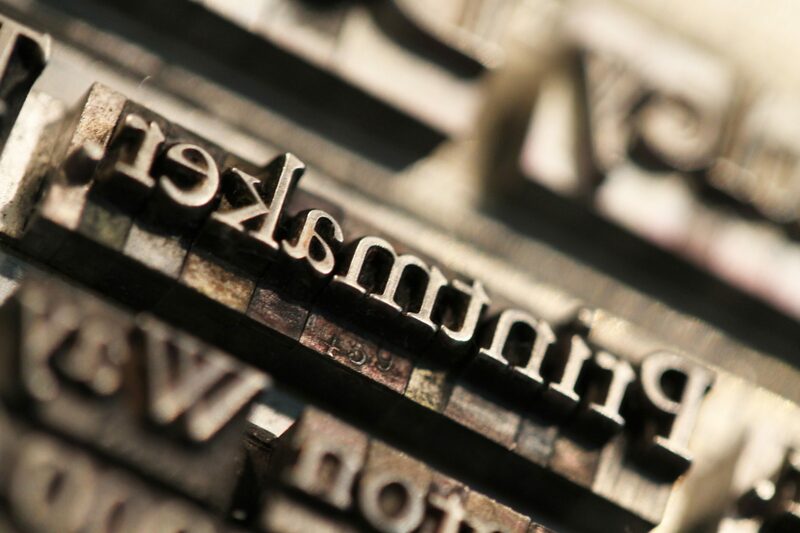 Most of the time we print with ink on paper, either by carving a woodblock, scratching into a metal plate, drawing on a stone or pushing ink through a screen with a squeegee. We use presses to transfer the ink from the matrix (block or plate) onto the paper. Some of our presses are over 100 years old and weigh more than 1000 lbs. We are the only non-profit printmaking studio in Georgia. We are really proud of the fact that we not only provide opportunities for people to make art in the studio, to show their work in exhibitions, offer training and exciting classes for beginners to advanced levels but we hire artists to teach their expertise, helping them sustain their creative practice. We also have a great relationship with all the area colleges and university art programs and get students involved (with paying opportunities as well) and support emerging artists with 3 annual residencies which include free studio time, classes and an exhibition. It’s also really rewarding to work with younger students in elementary thru high school and provide an arts experience they may not have otherwise. One of our most popular events is Print Big! 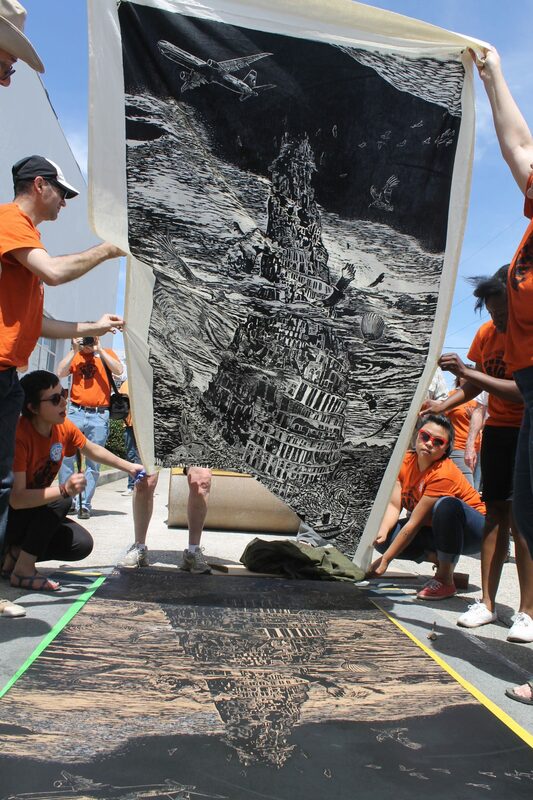 where we gather artists, university, high school and middle school students and they work collaboratively on giant 4×8 foot woodcuts based on a different theme each year. 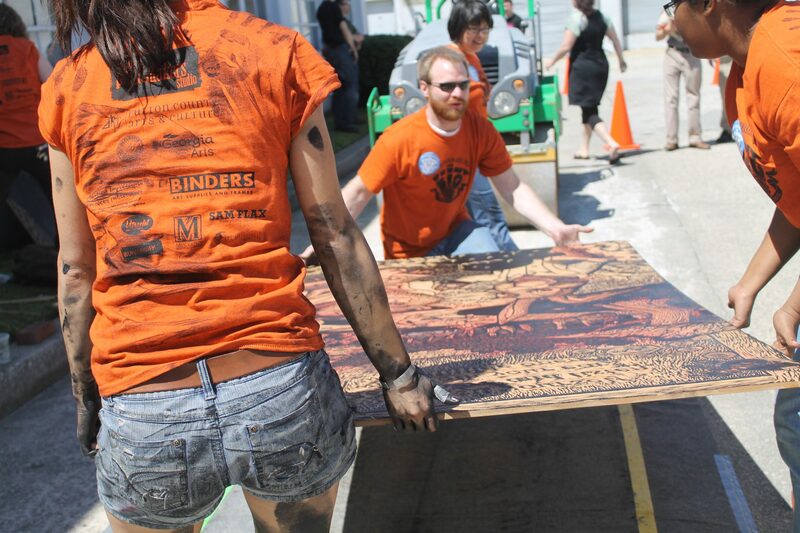 We host a festival type event with print demos, food truck, and t-shirt printing and we all print the blocks outside using a steamroller as the printing press. The work is impressive and it is so exciting seeing everyone work together to ink up and print the big blocks! Well, growing up I was the oldest (two younger brothers) so I guess I was pretty bossy and independent. I hope that has translated into leadership rather than being pushy LOL. Although I consider myself an introvert, an observer, and pretty shy, when I wasn’t drawing or reading Nancy Drew, I was the one organizing the neighborhood kids in fantastic dress-up parades down the block or putting together magic shows in the backyard. Since I had zero chance of joining the Cure, after high school I went to art school because that was really the only thing I was interested in. 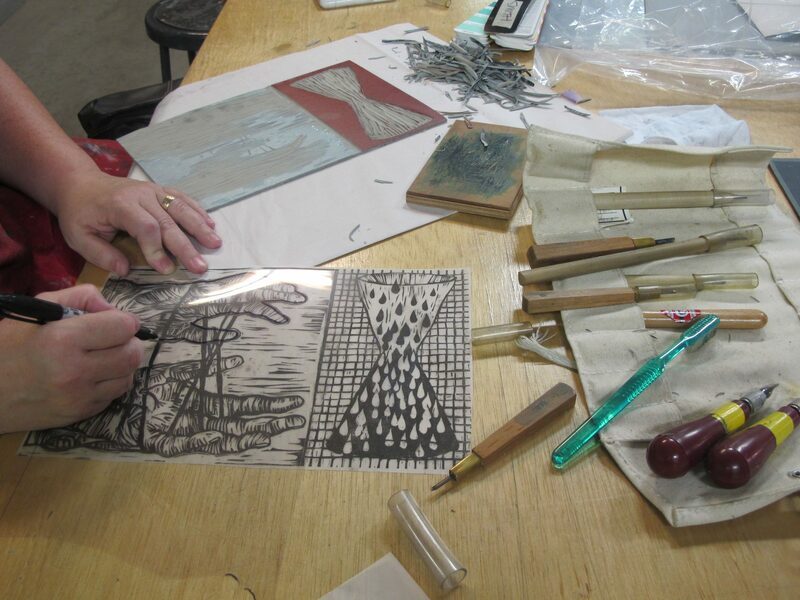 I didn’t have much experience beyond painting so when I took my first printmaking class it was a revelation. Having to think through so many possible techniques, layers, colors and textures to communicate my ideas was maddening and simultaneously thrilling. When I carved my first woodblock I knew that was what I wanted to do for the rest of my life. I love the physicality and repetitiveness of the process as well as how the drawing line is subverted by the medium. The expressive power of the relief printed image hooked me back then and it is still my favorite technique. With my students, I want to be a cheerleader and supporter. I love mentoring and encouraging younger artists and sharing the medium I am so passionate about! I learn new things from them all the time and am inspired by their ideas and innovation.